Thursday I opened the hives for the first time since package installation. I needed to see if my queens had been released from their queen cages and I was curious to see how much of the supplemental food the bees had eaten. It was a bit rainy out and for some reason I couldn’t get motivated to start up the smoker, so I chose not to. Which worked out perfectly. 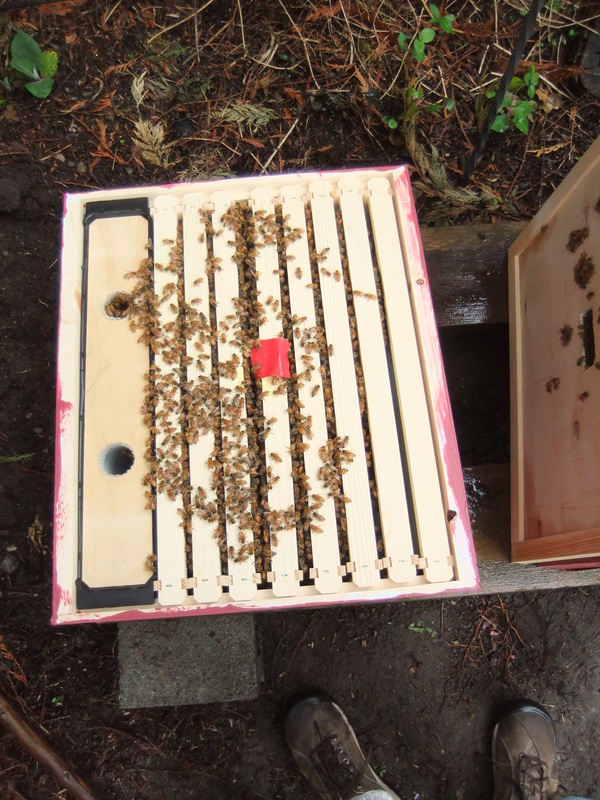 The bees were busy drawing out comb, the light rain discouraged them from flying, and there wasn’t any propolis gluing the frames to the box yet, so it was a quick and easy job to inspect them. Galactica, with bees building on four frames. On a recommendation from Jamie, I am alternating which hive I open first. That way I won’t let nerves bias me against the first hive. Thursday it was Galactica’s turn to go first. 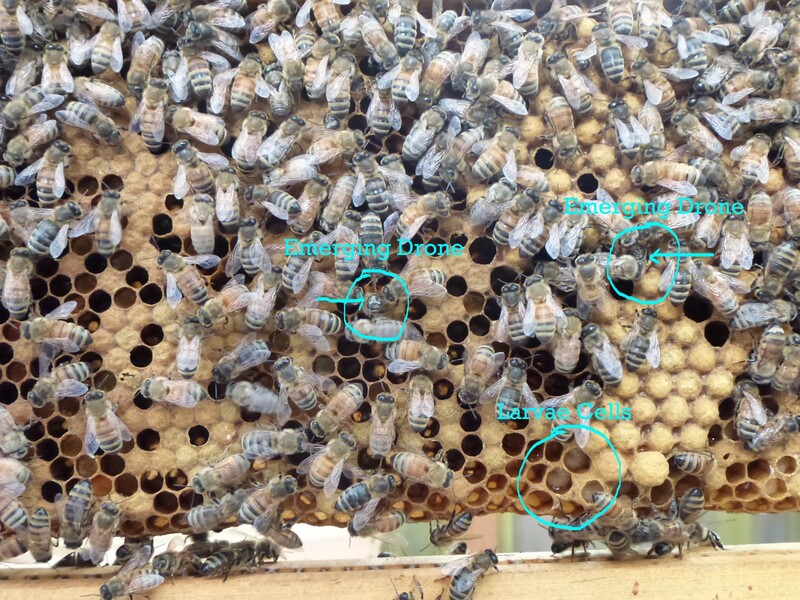 I found that the bees were occupied drawing out comb on four frames. The queen had been released. About one-third of the sugar water had been consumed and a few bees were feeding. Despite my mesh baskets and floating corks, there were a few dead bees in the sugar water. These I dug out with a stick. I filled the sugar water feeder and closed up the hive. Galactica's girls hard at work drawing out the comb. Next I opened up Themyscira, which contained about twice the bees that Galactica had. At first I assumed that Themyscira must just be happier because it has the honey, so the bees weren’t all out foraging. However, the bees would be unlikely to do much foraging in the rain. A fellow beekeeper suggested that some of the bees from Galactica might have decided that they like Themysicra better and drifted over there to make themselves at home, much like the stray cats who adopt the nice next-door neighbor who puts out the good food. 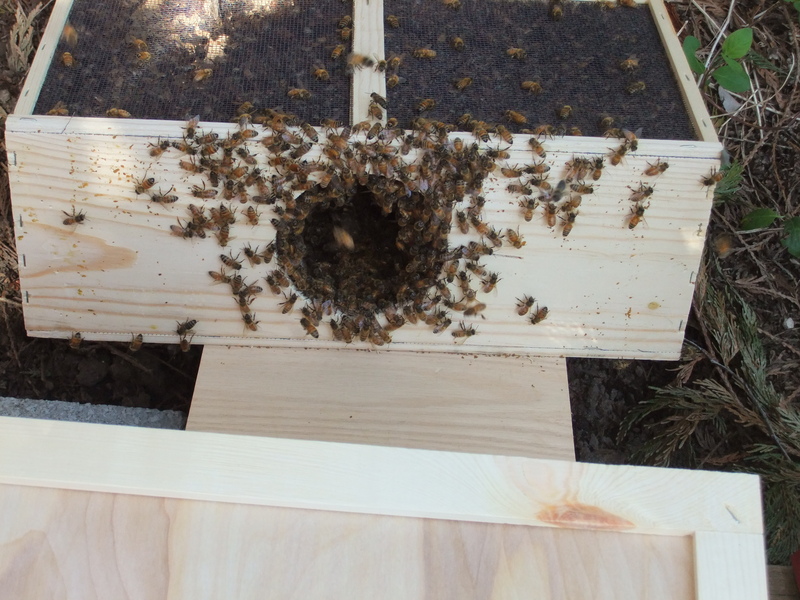 Themyscira with bees building on all eight frames, and bees hitting the feeder hard! Themyscira was full of activity. Tons of bees were at the feeder, and bees were drawing out comb on all eight frames. 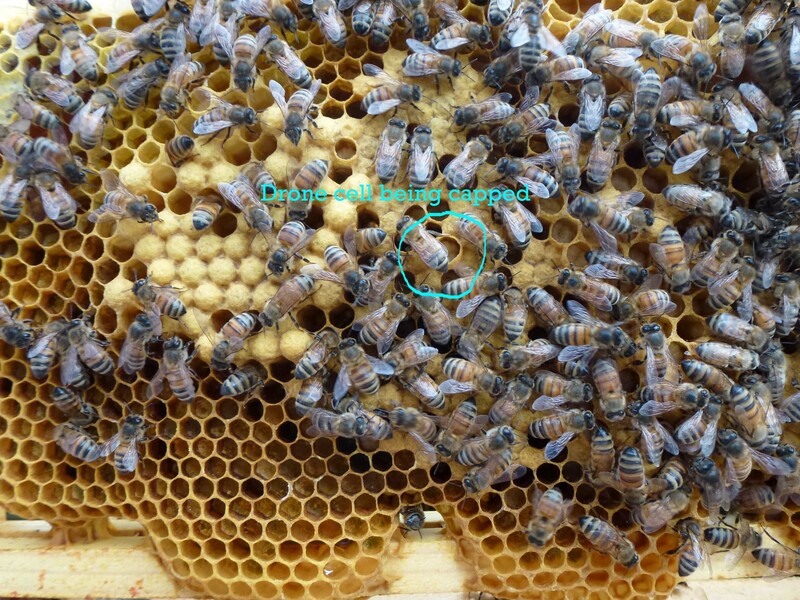 I spotted uncapped honey in some of the combs. 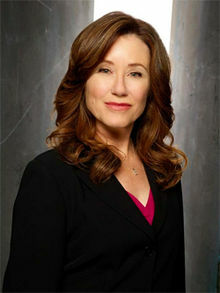 The queen cage was empty. Although the honey was low, I didn’t fill it. They were doing so much work on eight frames already that I thought more honey might cause them to try to work too fast. When I inspect them again tomorrow I will see if I think they need more. I suspect they will be fine as we’ve had nice weather again this weekend. Themyscira's girls drawing out comb. Look how many of them there are! Poor Galactica. Today, two days later, I was considering opening up the hive again to see if I could spot eggs and to see what the balance of bees was like between T&G. I may move a frame of brood comb over to Galactica if its population stays small. However, unusual activity in the hive this afternoon made me decide to put off the inspection. I first noticed the bees from the second story of my house. There was a whole lot of flying activity up that high. Given I have had these bees for six days, I didn’t know what to make of it. I thought to myself…Wow…that’s a lot of bees out. Why are they all flying around like that? Are they happy to see the sun? No, they must be hungry. [I have been secretly worrying about their hunger because I chose not to give them pollen patties, which sound akin to Twinkies for bees. Blech. But being new and not-mainstream, I keep second guessing myself.] I emailed my beekeepers group about the pollen patties. I went back to staring at the bees. Since these are brand new packages, I didn’t expect to see so many bees outside the hive all at once, but I attributed that to being hungry and needing to forage. About 10 minutes later, I went outside with my kids and there was a tornado of bees around the left hive. I had just read another beekeeper’s email about swarming and I thought to myself that the bees might be swarming. Which of course makes no sense since they have plenty of room in their hive, but they were upset and there were tons of them. I decided to go investigate. There were bees everywhere, landing on every plant in the near vicinity, on the fence, on the ground, on the top of the hive. On the side wall of the hive there was a thick patch of bees, clustered together in 3×4 inch mass. There were bees entering and exiting the hive, but many of them were outside, acting upset or confused. I went inside to don my suit, got distracted by the kids, and didn’t make it back out for fifteen minutes. And fifteen minutes later, the hives were normal again. I don’t know what occurred in that interval. I am planning to inspect them tomorrow to see if everything looks OK. From the outside, I saw bees laden with pollen entering both hives. The noise level was down. I could walk through the yard as normal. I don’t know what to make of it. Though perhaps I should consult the seismology website to see if we were having an earthquake or something! 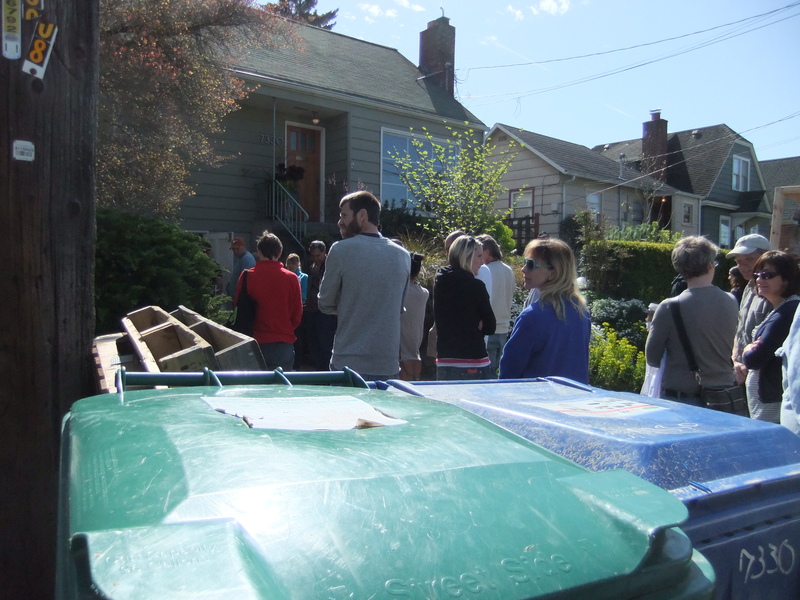 At least 50 people were lined up outside Corky's house to pick up their packages of bees. It was so inspiring to be around that many backyard beekeepers, many of them beginning their first hives. When a sunny spring day lands on Earth Day, what better way to celebrate than by setting up hives and installing bees? Since I couldn’t think of one, that’s just what I did! I now have two hives in the backyard. The hive on the left I decided to call Themyscira, the legendary home of the Amazons (at least according to DC Comics), including one Diana of Themyscira aka Wonder Woman. Since these bees are wonder women to me, I figured Themyscira would be a good home to them. I’m calling the queen in this hive Diana, of course. 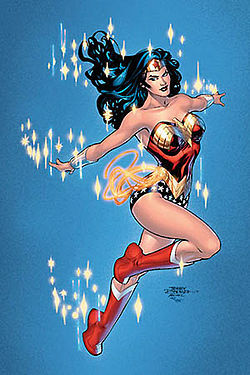 Diana of Themyscira, Queen of the Hive! Themyscira is going to be a bit of an experimental hive. I am feeding it honey instead of sugar water and seeing what effect, if any, that has on the health of the hive. I bought honey from the local coop, so I don’t know the bees that produced it. This could prove to be problematic since it is possible that I have just imported disease spores and other maladies into the hive. However, I feel weird about feeding sugar to bees as I just can’t see how it would be good for them. In humans, sugar can cause all manner of unhealthiness and microbial imbalance so I can’t see how it is healthy for bees. As I am learning, the hive needs to be strong in order to balance bacteria, fungus, virus and other microbes and remain strong. In humans, if the intestinal flora is out of balance, you can see thrush, infection and other disease. It seems intuitive to me that this would be the same in a hive. When my children were infants, I chose to exclusively breastfeed them, since human milk is best for human babies whenever possible. In a hive, sugar water is like formula. Better than starving to death and good in emergencies, but whenever possible, honey, pollen and nectar are best. So, Themyscira is feeding on Northwest-produced honey that hopefully harbors no disease. The hive on the right has been christened Galactica after our favorite sci-fi series in recent years. The Battlestar Galactica survived the Cylon attack because it wasn’t full of modern technology and relied on analog equipment. Since I am trying natural/biological beekeeping, I thought a nod to the Galactica would be appropriate. That queen will be called Laura (though Dave might prefer Model 5). As the “control hive” Galactica is getting sugar water. At the Seattle Biological Beekeepers meeting a couple of weeks ago, I learned about a gentle package installation method which I tried yesterday. It went really well, though it was a slow process and probably would have had less success on a cold day. The technique was simple: no smoker, no sprayer, no shaking. 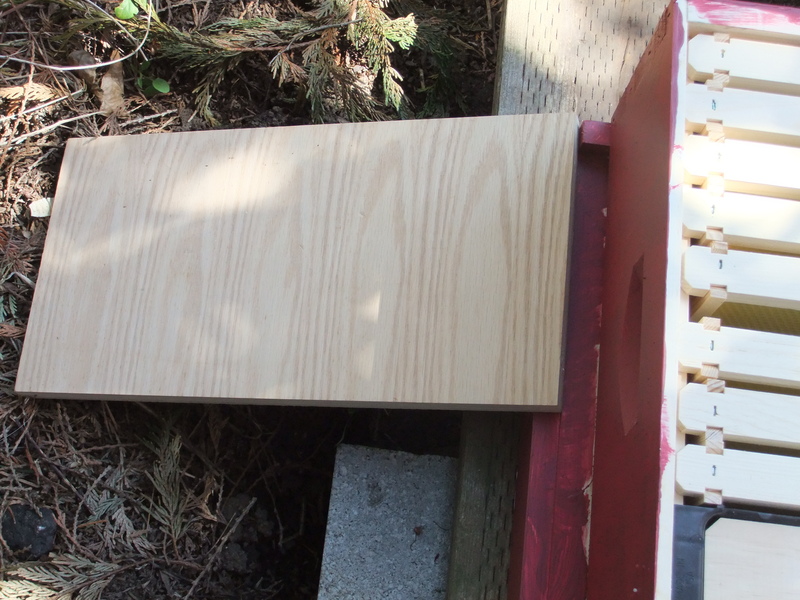 I made a ramp from the ground to the hive with a piece of scrap plywood. Then, I slowly raised the sugar water can to remove the queen cage. The cage was covered in worker bees, which I gently brushed into the hive. Then I placed the queen cage on a center frame and duct-taped it into place. 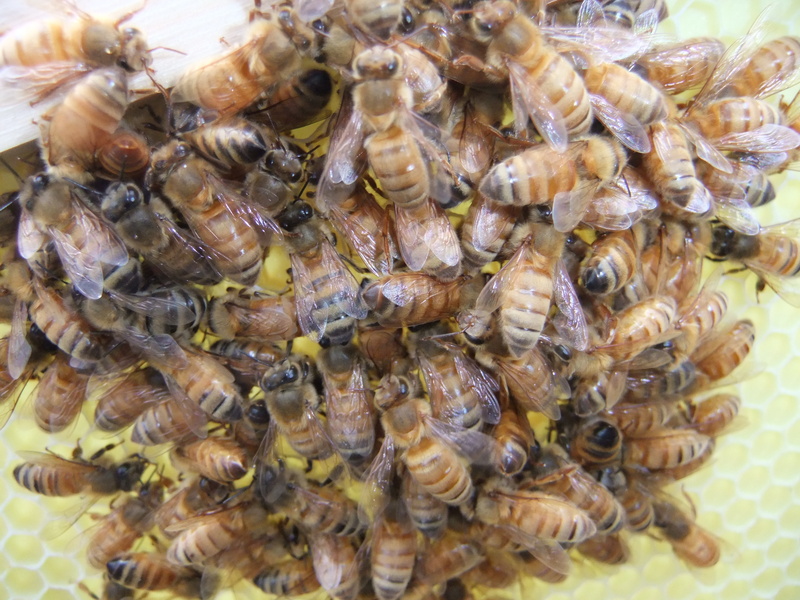 Queen placed into the hive. I carried the package to the ramp, rested it on the bottom of the ramp and removed the sugar water can. I brushed as many bees as I could into the hive from the bottom of the can. Then I placed the lid on top and set the sugar water can over the hole in the lid. I wet a cloth with honey water and painted a stripe of the honey water leading from the package to the entrance of the hive. Then I left the bees alone. Bees wonder what the heck is going on. At first there was a whole lot of flying around. The bees were clearly confused and disoriented. Finally a few bees followed the honey water trail to the hive entrance and disappeared into it. Once I saw that happen I went inside for lunch. I checked the bees every half hour or so. It was midday and warm, so lots of bees were still flying about. By two hours, more were starting to enter the hive. By three hours, there was a single-file line of bees marching from the package to the hive. 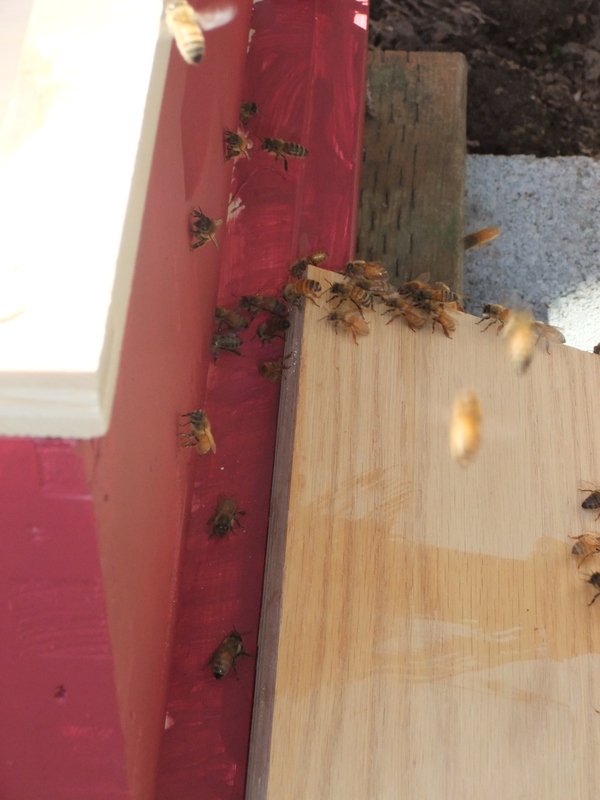 Bees march up the ramp into their new home. By four hours everyone was inside and I removed the package. The second package went a bit faster, probably because it was later in the day making the bees a bit more motivated to get inside for the night. By the two hour mark, they were all settled in except for one stubborn clump of bees that was still hanging out in the package. I saw at least a dozen bees on the outside of the package working on explaining the situation to those bees. They were gone this morning, so I am assuming the holdouts made it in before dark. 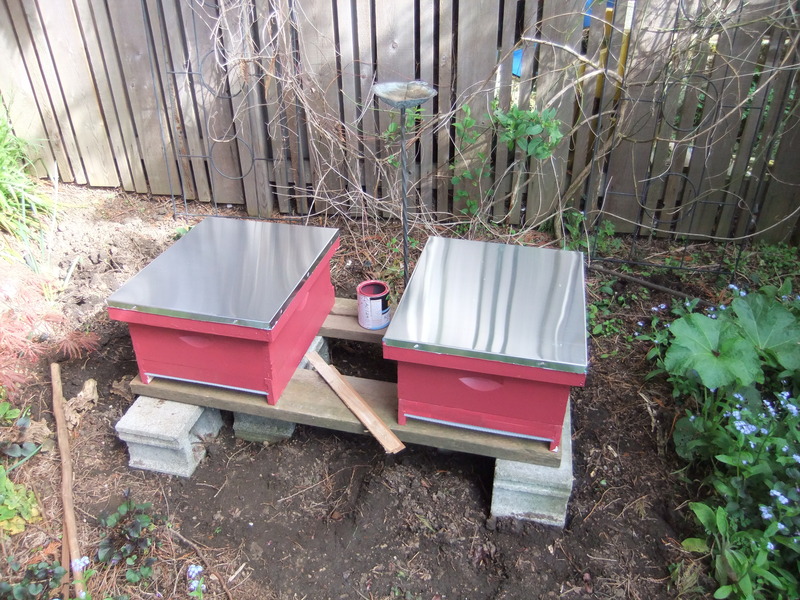 The installation process was really smooth, which gave me a spark of confidence as a new beekeeper. I’m sure that feeling won’t last long, but I was glad that the bees and I were able to start gently. I am also glad for the little helper who materialized to assist with the second package installation. Within five minutes he had conquered his nervousness and was handling the package on his own. The littlest one made it plain that she is not about to be left out, so it looks like I will need a third bee jacket pronto! Self portrait with bee gloves on. Needs a little work! My bees are due to arrive in the next week and at this point I feel a bit like I did in my ninth month of pregnancy: Really ready to be done waiting, and scared to death about meeting my new babies. What if caring for these bees isn’t what if I expected? What if I kill them? What have I chosen? Luckily, I can always give the bees away if I prove an unfit caregiver, but it’s still a little nerve-wracking to be on this precipice. At least my ankles aren’t swollen! To help prepare for my new arrivals, I attended a meeting of the Seattle Biological Beekeepers on Monday. This lovely group of beekeepers is dedicated to chemical- and pharmacological-free beekeeping, with the goal of developing locally adapted strains of bees that can withstand disease and infestation. It is an admirable goal though it seems heart-wrenching and expensive. Luckily, these beekeepers are helping me mentally prepare for colony losses in the early years. The local wisdom is that you lose many of your colonies in the first 2-3 years, but your colony losses diminish as the bees become more adapted to the region and more resilient because of the chemical-free approach. This approach fits well with my outlook on human health: that our bodies do best in healthy and low-stress environments that include access to nutritious foods, rest and supportive therapies. 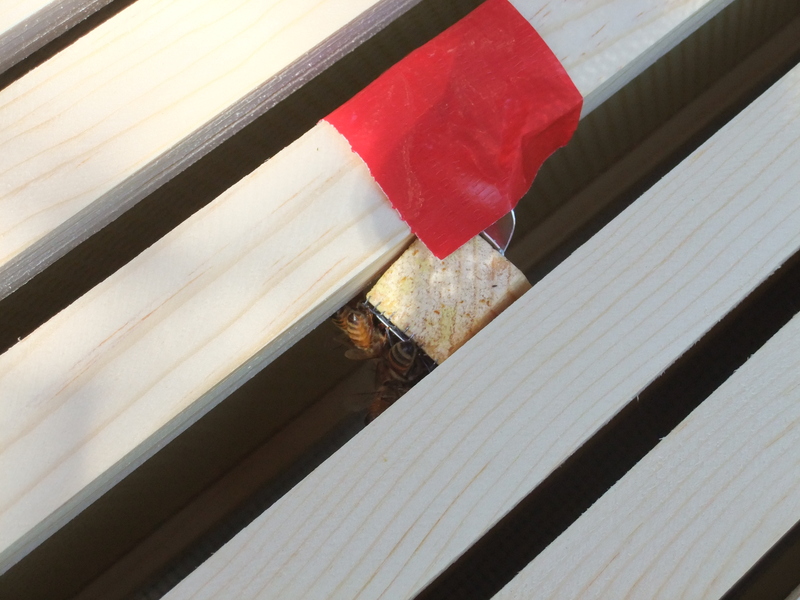 Tuesday I had the good fortune to assist my friend Jamie in performing his first spring hive inspection. 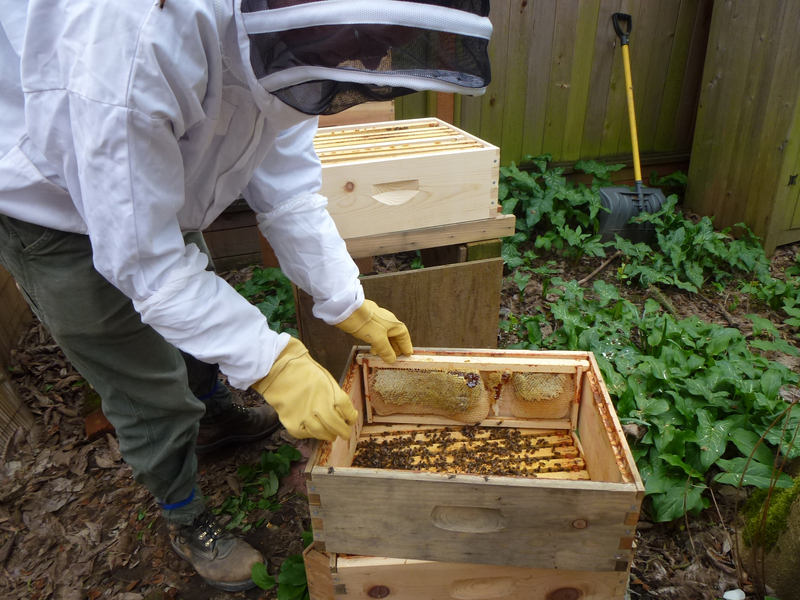 Jamie has two hives, and I was only able to observe one of his hives as we worked slowly so that I could learn. Jamie opens the Blossom Bandits' Hive. It was a super fun morning as I got practice wearing my new veil, using a smoker, and listening to the sound of the bees. Some of the things Jamie showed me were pretty dramatic, like how upset the bees get when you pop the frames to break the propolis. He also demonstrated that bees respond really unhappily to carbon dioxide. If you puff air at them, as if you were letting out a sigh or cooling off a spoonful of soup, the bees rise up straight at your face. I was happy to get a bit acclimated to the hood, veil and gloves. It does feel like a bit of a spacesuit and I found that my depth perception was muddled by the mesh. I received my veil as a Christmas present from my mom and I’m quite happy with it. The zipper and velcro system is set up in such a way that I can’t easily forget to seal all the parts, and it has a hat with a veil attached, not just a hood. The brim of the hat keeps the bees a good distance away from my face, which feels comforting when they are upset. Jamie has a hood-style veil and the bees were only about an inch from his face. I think that would have freaked me out. 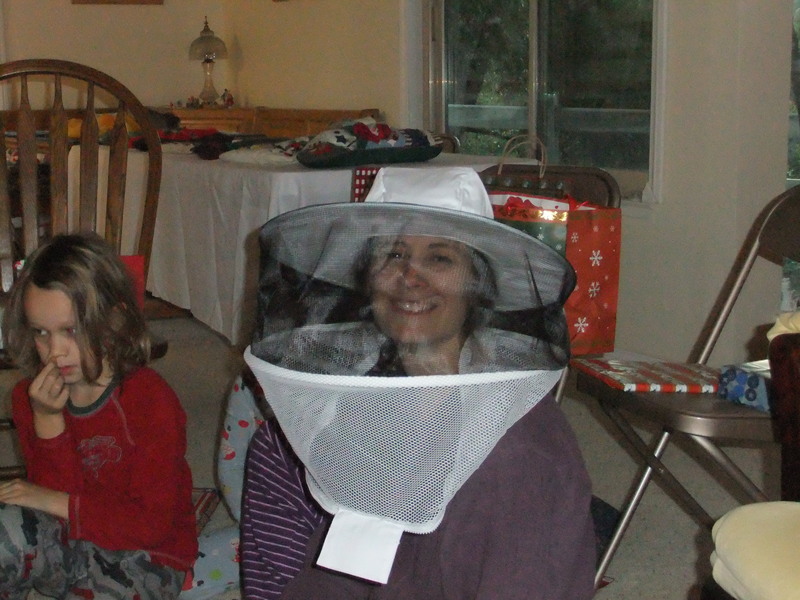 Christmas morning 2011 - My new veil! 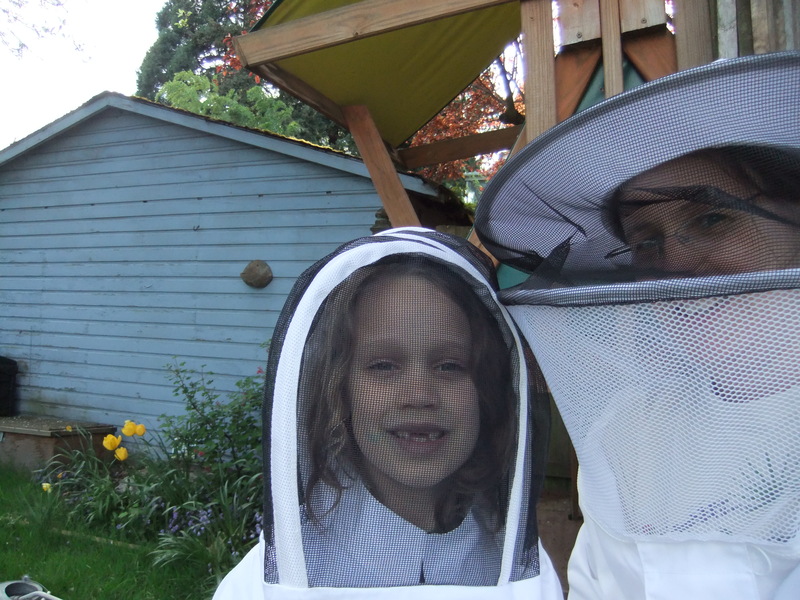 Jamie gave me several good tips about leveling my hives. 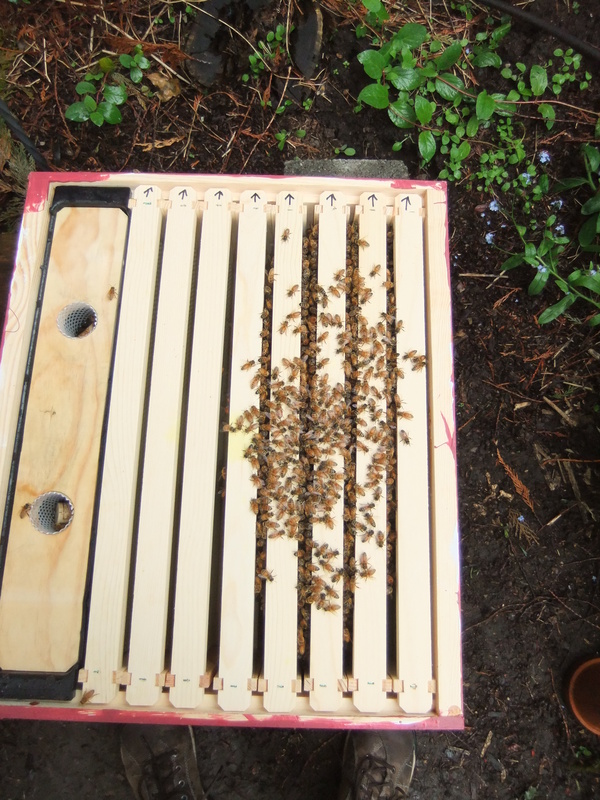 I can tip them from back to front at a slight incline so as to let any moisture drain out of the hive. However, I want to make sure that they are level from side to side or else the bees will build the comb unevenly. Those tidbits were timely since the kids are on spring break this week and we will be getting the hives ready for action. Jamie also draws arrows on his frames so that he can orient them in the correct direction after inspecting. So I am now adding a sharpie to the collection of tools in my bee bucket. Here are some shots of Jamie’s hives. I believe the one was inspected is called “Blossom Bandits.” We saw several drones emerging from their cells, eggs, larvae and honey stores. There were about a cup full of dead bees in the bottom of the hive but overall the bees looked vigorous (at least to my untrained eyes). Brood cells with lots of drones. Larvae cells and emerging drones. My two packages of Carniolan bees are due to arrive from California later this month. Over the past few weeks, as I’ve been slowly and diligently applying paint to my new hives (which is taking FOREVER because it has been too damp for the paint to dry quickly and the garage is small, so I have to paint in small batches), I’ve had plenty of time to think about my bees and wonder what they are up to down in California. Hopefully, they are hatching, eating and enjoying some better weather than we have had! Bee suppliers are usually located in warm regions. For the Pacific Northwest, this means California. As spring arrives earlier in southern states, the beekeepers there have more time to grow queens and divide hives. However, California, with its dry climate, does not have enough forage to support many hives of bees. So, while they can grow the bees, California beekeepers rely on beekeepers from other parts of the nation to raise them in areas with better pollen production. Almond tree pollination, which typically runs from mid-February to mid-March, is big business in California. Commercial beekeepers from across the country ship their hives to California to overwinter and then be used for almond farm pollination in the spring. They are paid for loaning their hives for this purpose. California itself cannot support enough hives to pollinate all of the almond farms. About one million hives are trucked in each winter and head home after citrus pollinating season later in the spring. So, now that it is April, the hives that will give rise to my packages have finished toiling in the almond orchards. 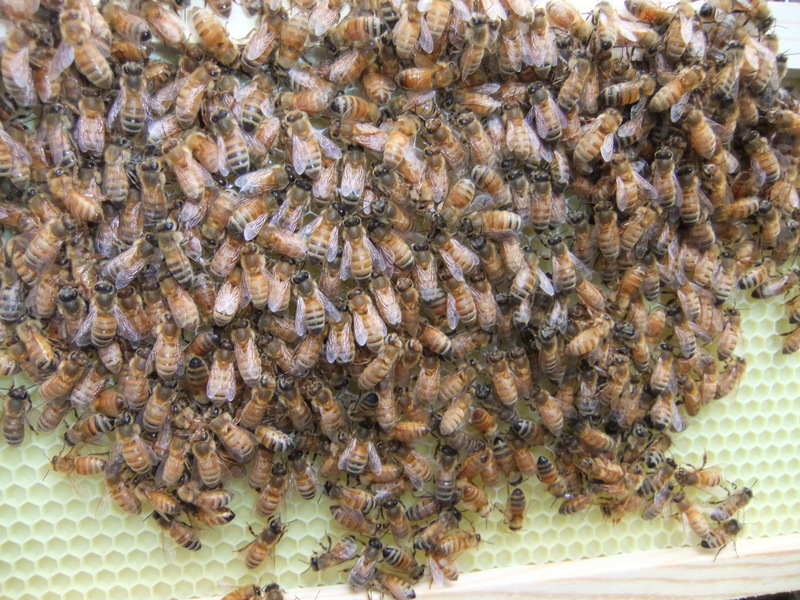 The beekeepers will now be growing queens and encouraging the hives to multiply almost to the point of swarming. They will divide the hives (hopefully before swarming occurs) and set them to growing again. 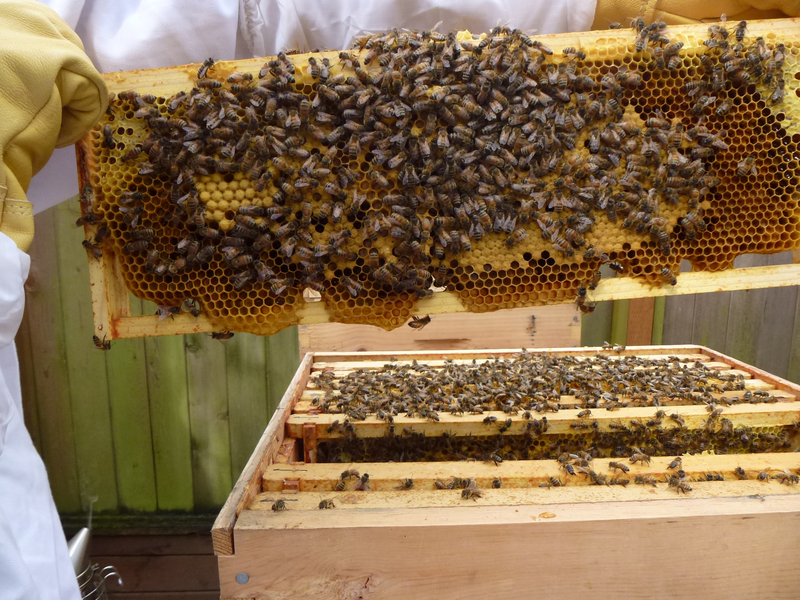 They may put queen excluders into the hives at this point to make it easier for them when bee packaging day arrives. Or, they may just have a team of beekeepers who find the queen in each hive when the big day arrives. When it’s time to package the bees, beekeepers will bundle a queen and a few worker bees (as queens cannot feed themselves) into a little mini-package called a queen cage. The beekeepers will have built hundreds of larger bee packages out of wood and wire mesh, with a large hole cut out of the top for one for a can of sugar syrup to feed the bees while they are traveling to their new homes. With these things ready to go, they don their suits and get their smokers going. And while the process varies from beekeeper to beekeeper (of course!) here’s how they typically get the bees into the package. Team A goes to the hives with the smokers and calms the bees. If they don’t have queen excluders on the hives, then Team A also finds the queen. They pull out frames from the hive, laden with worker bees. Team B has the packages and a large metal contraption that looks like a giant pot with a metal duct growing out of its base, and a wide-mouthed funnel attached to the end of the duct. The wide-mouthed funnel fits into the sugar syrup can hole. Team A takes the frames and shakes them (pretty hard sometimes!) into the pot. The bees fall down the duct, through the funnel and into the package. This process is repeated several times until the package has the right amount of bees in it. The right amount is determined in at least two ways. Some beekeeping outfits use scales. Others have a “fill line” on the packages. So, they add bees, shake the package so that all of the bees fall to the bottom, and then see if the package is full enough. 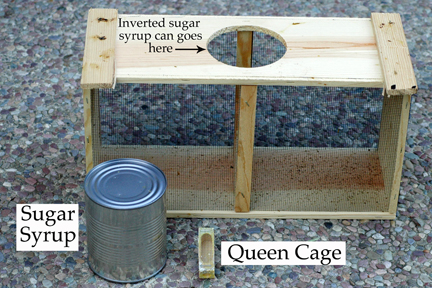 Once the package is full, the queen cage is placed inside, a can of sugar syrup is inserted and wood is nailed over the hole to seal the package. This video shows one beekeeper’s approach. I found it via the A-Bee Honey & Costanza Orchards. They included this sweet disclaimer on their website, “Please understand that the information presented may not reflect the same attitude and beliefs of A-Bee Honey or Costanza Orchards in the various management practices that are exhibited in these video presentations.” Which is to say, the beekeepers in this video are pretty rough with their bees and smash or vacuum up a number of them. Yikes!